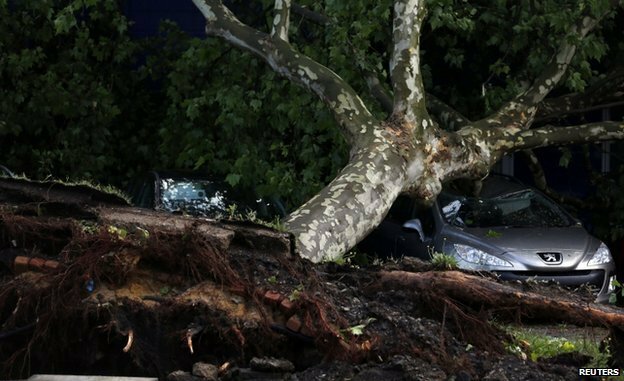 Violent storms have hit western Germany killing at least six people overnight. In the worst incident, three died when a tree fell on a garden shed in Duesseldorf where they had sought shelter, emergency services said. Cyclists were also killed by falling trees in Cologne and Krefeld and a sixth person died while clearing a street in Essen. The storms ended a heatwave that lasted throughout the Whitsun weekend holiday. Public transport was badly hit in much of North Rhine-Westphalia on Tuesday morning, and authorities urged people to avoid Duesseldorf, where trains, roads and the airport were all affected. During the night, emergency services removed the bodies of three people from a garden shed in the city. Three other people who had taken refuge in the shed were injured, two of them seriously. Several others were hurt elsewhere in the city. Streets in Duesseldorf were blocked by fallen trees and there was damage to overhead power lines. The tram system was reportedly suspended. There were traffic jams on 165 miles of the region’s roads during the morning rush hour, local broadcasters reported. Winds of up to 93mph were recorded at Duesseldorf airport on Tuesday night and the storm was continuing to move north-east, towards areas north and west of Berlin, forecasters said. “We must reckon that the total damage will run into double-digit millions,” North Rhine-Westphalia’s Interior Minister Ralf Jaeger told German media. Lower Saxony to the north has also suffered heavy damage. Temperatures of up to 97F were recorded in Germany at the weekend, the highest ever recorded for the time of year.